I don't consume a large amount of coffee, but occasionally I enjoy an espresso after a meal or on its own. For those of you stuck in an office, popping out for a quick one can be a good way to avoid the daily 1430 (2:30pm to those of you still using 12-hour time) food coma. The "green" movement has led to a lot of good things, but in my opinion one thing that shouldn't be messed with is the proper presentation of food or drink. In most of Europe (and in the olden days here, I assume), the only place one will get served coffee in a recycled paper cup is Starbucks. In San Francisco, which admittedly is one of the epicenters of the green movement, there are coffee shops all over the place. In some cases - like the financial district - one can find 3 or even 4 within a single block. As you can imagine, they're all using paper cups. This is the result of walking up to the register and saying these exact words: "one espresso, please" - one shot of espresso dumped into a paper cup (hey, it's recycled) and slapped on the counter. Sugar, milk, and the obligatory-in-San-Francisco vegan organic rice/soy/almond/whatever milk are to be found on a messy common area, along with some wood sticks for stirring the coffee. Total cost: USD 1.65 (a tip of 0.35 would be customary for a total of $2.00). The other day I had the opportunity to stop by the Café Gourmet at the Hotel Schweizerhof in Zürich, Switzerland. Now, I realize that the dime-a-dozen coffee shops in San Francisco's financial district shouldn't be held to the same standard as the café of one of the best hotels on the Zürich Bahnhofstrasse in Switzerland, but we are discussing the difference in experience. And, fundamentally, these two places are in the same line of business and provide at least one exactly similar product (espresso). These two experiences are so different it's difficult to write about them in the same paragraph. 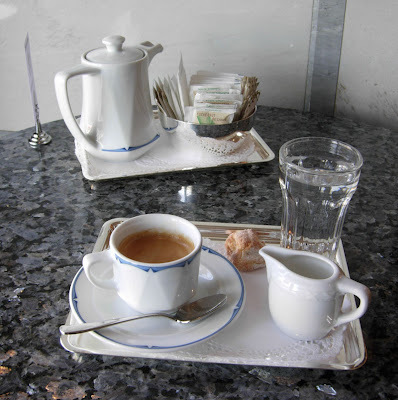 For CHF 5.20 (no tip is necessary or expected), or about USD 5.00, I get a sterling silver tray with paper doilies, the cup, saucer and cream pitcher in china, a real spoon (also sterling silver), a sweet (coconut macaroons were on offer this day), and a small glass of water. Each table in the café is already set with its own tray containing milk and sugar. Is it just me, or is it worth trying to do more than the minimum? 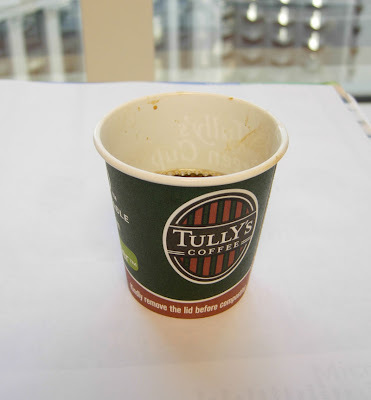 I don't know, but I'll not be ordering any more espresso at Tully's. Coming soon, or more realistically, whenever I get around to it: the results of the above test applied to one of the 4-star hotels in San Francisco. In the meantime, check out Coffee Ratings (San Francisco Espresso: A Pocket Guide), a great website containing a database of quantitative evaluations of San Francisco espresso.